Less than a month after the last retail sales report, the US Census Bureau will publish its March release as it plays catchup following the delays caused by the government shutdown. The March retail sales numbers are scheduled for release on Thursday at 1230 GMT. After plunging unexpectedly in December and struggling since then, consumer spending is anticipated to have rebounded substantially in March. Weaker household spending has been evident in most barometers of consumption since November/December, raising alarm bells about the US growth outlook. Softening consumption was one of the reasons that prompted the Federal Reserve to hit the pause button on further rate increases earlier this year. 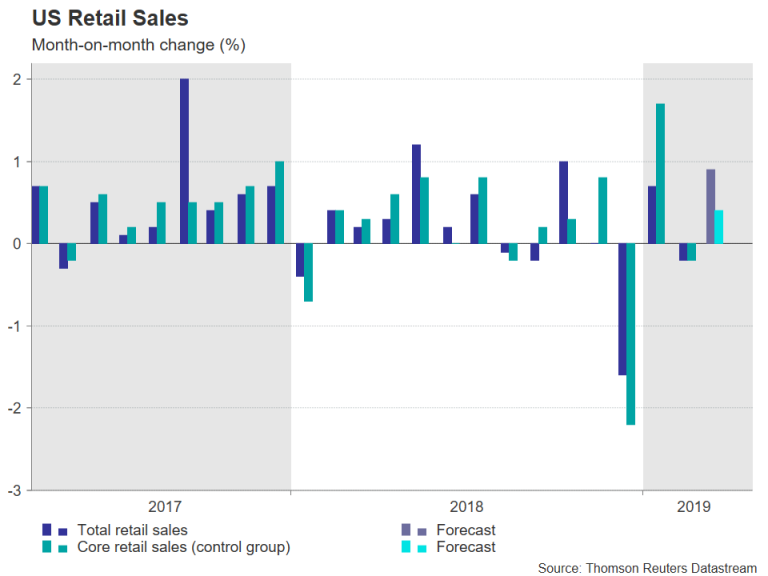 The March retail sales report could offer the first indication that consumption is recovering more sustainably after a failed rebound in January. Retail sales are expected to have surged by 0.9% over the month in March after a surprise 0.2% drop in February. If the forecasts are met, this would make it the strongest gain since October 2018 before consumers began reining in their spending. Excluding auto and gasoline sales, retail sales are forecast to have increased by 0.7% month-on-month, more than undoing the prior month’s 0.4% fall. While the closely watched core measure, ‘the retail control group’, which excludes autos, gasoline, building materials and food services, is also expected to have returned to growth, rising by 0.4% m/m. The retail control group sales are used in GDP calculations so a strong bounce back in March could see first quarter growth estimates being revised higher. The Atlanta Fed’s GDPNow estimate for Q1 has been steadily edging higher and currently stands at 2.3% annualized rate, slightly above Q4’s 2.2% figure. That suggests US growth has merely slowed to nearer trend levels rather than is heading towards a recession. However, although the chances of a recession may be receding and probably were not that high to begin with, there are still significant downside risks that pose a danger to both US and world growth. Global trade remains fragile despite the positive headlines regarding the US-China trade talks. An agreement between the two trading partners is not a done deal, at least not yet, and the US is now extending its fight to Japan and the European Union. Other worries include Brexit and sluggish growth in the Eurozone. On the bright side, even if the global uncertainties continue to weigh on exporters and business spending, the Fed’s recently adopted ‘patient’ stance should help avoid another slump in consumer spending like that seen in December. A tightening labour market, and in turn, faster wage growth, should support future spending. Personal consumption makes up about 70% of US economic output, so as long as households continue to spend, GDP growth should remain positive. Looking at the possible reaction in forex markets, a positive surprise in the retail sales numbers could be the boost needed for dollar/yen to break above immediate resistance just above the 112 handle. There is strong resistance around 112.18, which is the 23.6% Fibonacci retracement of the 104.55 to 114.54 upleg. To the downside, unexpected weakness in the data could see the pair falling towards the 50-day moving average, which lies slightly above the 111 level. Previous articleEuro Area PMIs: Too Early for a Substantial Rebound?